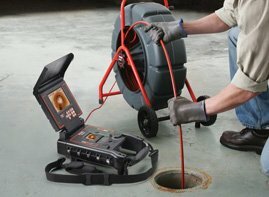 At Urban Tide Plumbing we have the equipment to see exactly what is down your pipes by using a high tech pipe inspection camera. This allows us to pinpoint the exact location of a blocked drain and quickly diagnose what is causing the drain problem. Using the camera will save you time, money and unnecessary digging. It takes out all the guesswork and will confirm the cause of the drain problem (e.g. tree roots, damaged pipes or other forms of obstruction).